If you have read my previous posts, then you know of my personal war with one of several invasive and non-native plant or animal species in my backyard here in Chelmsford. I would like to think that I am not alone in this endeavor, either locally or regionally. So far I am not disappointed by my on-line excursions. 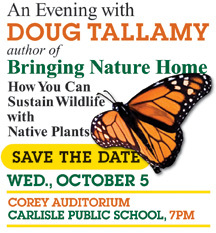 If you are interested in gardening for wildlife, butterfly gardens, plant or wildlife ecology or are just beginning to develop an inkling of interest in this topic I strongly recommend you take advantage of a rare opportunity to hear one of my top-list authors and a well respected scientist, Doug Tallamy (Bringing Nature Home: How You Can Sustain Wildlife with Native Plants) lecture this Wednesday night (October 5, 2011) in Carlisle, MA. The event is being sponsored by the Carlisle Conservation Foundation, Susan Zielinski Natural Science Fund, and Carlisle Conservation Commission and will begin at 7 pm at Corey Auditorium in the Carlisle Public School. As many gardeners undoubtedly do, I use my garden as an expression of what is attractive to me as an individual. Also, as I have a strong interest in nature and ecology I seek to do the right thing while expressing myself in this artistic way. I want what I put in my garden to function in sync with the natural environment. Mr. Tallamy who is also a renowned entomologist (insect ecologist) at University of Delaware provides abundant scientific documentation to support that alien plant introductions generally do not have a productive ecological relationship with our environment. This is because they often have different characteristics such as leaf chemistry, time to maturity, or time to bud and flower. What this means is even though they are phisically present in our natural environment, they are not contributing or giving back energy to the system the way a native plant would (just taking it away). We, as gardeners, do have a choice. Now, more than ever before native alternatives to invasive horticultural varieties can be found. However, if you are not familiar with the horticulture trade or with these alternatives, it is easy to be overwhelmed and led in the wrong direction by a well-intentioned nursery worker, or even, a less than well-meaning individual who just wants to make money. For example, not all native plants are created equal. Some so-called native plants are actually naturalized alien plants from other countries. Some nurseries will push these plants as “native” or alternatives to invasive plants. Some plants are cultivar varieties (genetically altered) of our natives which may not possess identical or even similar traits to the native variety, depending upon what it was “crossed” with. These plants will often be touted in their descriptions as “pest tolerant,” “a caterpillar may eat the foliage occasionally,” “deer resistant,” “disease free,” “mostly allergy free,” good for naturalizing, etc. What a description like this tells me is that the plant does not possess a substantial ecological benefit and it is not contributing much in terms of food to native insects, which are the base of our regional food chain. Any of the descriptions I listed above would be a BIG “red flag” in my book. As an example, a lot of the statements above will often be found if you search for traits of the common butterfly bush (Buddleia davidii or Buddleia x weyeriana). Now, you are saying wait a minute, isn’t the butterfly bush good because it attracts butterflies? Well let me, and some of my favorite online sources, enlighten you. The butterfly bush is a butterfly magnet and I can often find many butterflies on it during the summer season where they seek the very abundant and nectar-rich flowers which bloom almost constantly from spring to fall. Tallamy’s research shows “not one species of butterfly in North America can use Buddleia as a larval host plant.” In particular, a large number of butterfly species are very plant-specific and will only use 1 or 2 plant types to deposit their eggs and provide food for their hatching larvae (think milkweed and the monarch butterfly folks). Without the presence of a particular plant, you cannot have a particular butterfly. Therefore, without larval host plants you cannot have any butterflies. Taken to the next logical step, if everyone is following horticulture and nursery recommendations to create a butterfly garden with the butterfly bush as its anchor plant, butterfly diversity (number and variety of butterfly species) will undoubtedly continue to decline as we raze additional natural land to build even larger suburban homes and replace these sites with sterile turf lawns. Now, here’s another little tidbit for you. 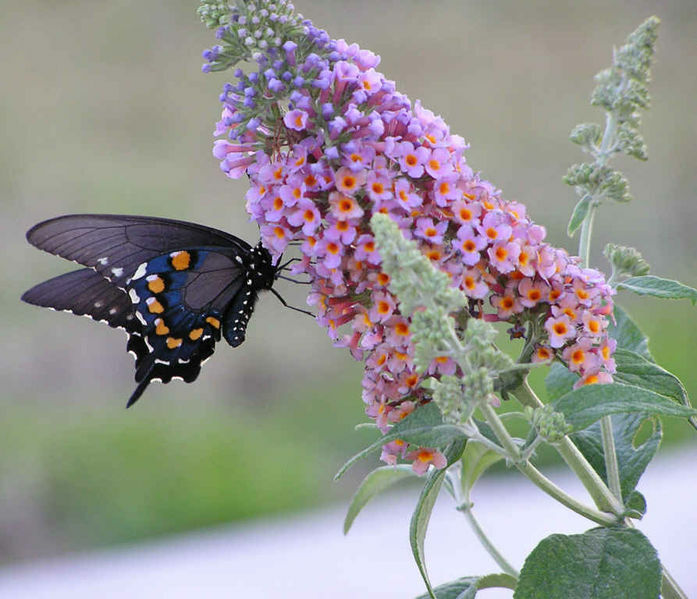 The butterfly bush is considered invasive in over 25 North American states, including Massachusetts, Connecticut and Rhode Island – that is if you go by the U.S. Department of Agriculture Plants Database. I can honestly say that I personally have not had any experience with this plant’s invasive tendencies but I have heard of other wetland scientists that have. It is not currently listed on our Massachusetts Prohibited Plant list and it also has not been evaluated (as far as I know) for noxious tendencies by the Massachusetts Invasive Plant Advisory Group. Other organizations, including the National Park Service, Audubon, and other state and governmental organizations have it on their “Invasive Watch List,” or have outright banned the sale of the plant. It is considered prolifically invasive in Zones 6 and 7 (Mid-Atlantic States such as PA and VA) as well as the Northwest. 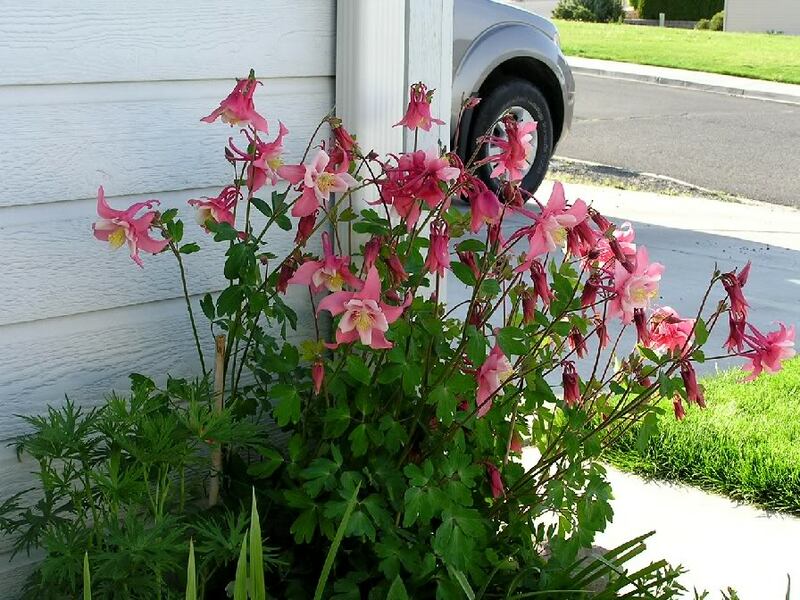 It is on the “Most Invasive” species list of the Pacific Northwest Exotic Pest Plant Council. In this region it is extremely invasive in disturbed natural areas such as burn sites and along large streams such as the Willamette River. 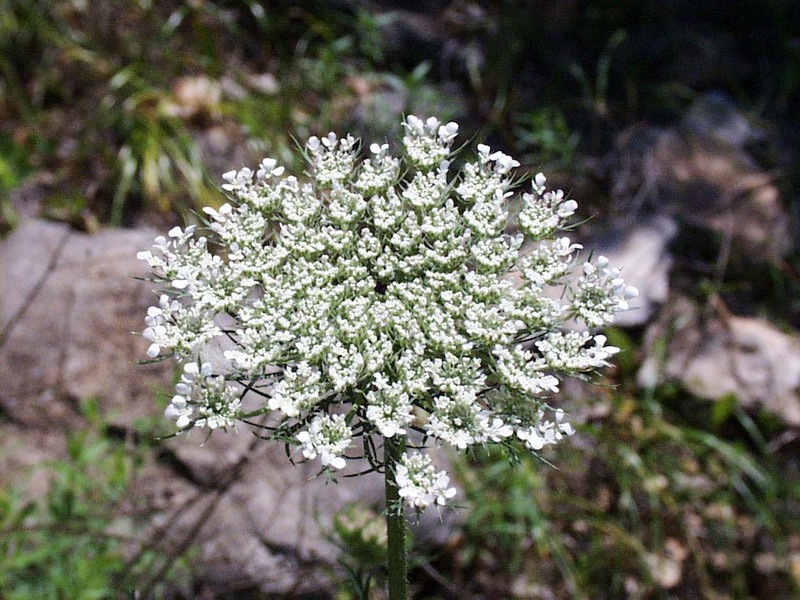 It has been a huge problem in England, where it is considered one of the top 20 noxious weeds, infesting large tracts of disturbed land 50 years after it was introduced in those areas. USDA Plants Database - Buddleia Invasive Representation in U.S.
You see every plant has a niche or a microhabitat which it prefers. I for one am not completely knowledgeable about this plant and what its preferred microhabitat may look like (I am NOT a botanist). But I can hazard some broad assumptions (thinking aloud folks…don’t read in more than that) based upon its noxious nature elsewhere. For example it appears to respond well to fluctuating wet environments where it spreads predominantly by very abundant seedlings. It likes riparian corridors and floodplains, especially such sites that have experienced some level of disturbance. The fact that it likes burn sites AND wet areas could reveal an interesting relationship with nutrient cycling on low pH sites (cold, wet or acidic sites) or the timing of availability of elements critical for plant growth following a disturbance (Nitrogen or Phosphorus). For example inorganic Nitrogen can be made available through bacterial fixation following a burn event and is often considered a valuable post-fire nutrient source. Another byproduct of fire to consider might be potash (Potassium in a water-soluble form) The time it took to infest U.K. sites makes me wonder how long the seeds remain viable in the seed bank once they are deposited there? Research on the Buddleia problem in the U.K. by Oregon State University has revealed that seeds from the plant require a long time to develop and release from the plant. Similarly, U.K. researchers have discovered that flower heads from a previous summer do not release seed until dry weather occurs the following spring. This could be very useful information. It is also possible that climate fluctuations or microclimate condition is sigificant. For example, does PA or VA normally have a dry spring (did we in MA have a dry spring in 2010)? In addition, practical application of this info suggests that pruning all of the spent blossoms from the butterfly bushes in the fall prior to full development of the seed could potentially limit release of the seed to native environments (possibly a best management practice?). Well at this point I am starting to ramble and very loosely hypothesizing with nothing to back it up. Needless to say, I have begun removing the butterfly bush from my gardens. Anyway, if you have an interest and are able to find time to attend Tallamy’s lecture in Carlisle, I hope to see you there. Great posting, thanks for thinking outside of the box on non-natives. It’s an important point to make that invasives may be better to take advantage of inter-annual variability in climactic conditions that slow native populations. I came across your post today while I was trying to identify the cocoon I found on my buddleia today. Now I’m really wondering about it since apparently buddleia isn’t supposed to be a host plant. But you know, evolution doesn’t stop for scientists, so maybe there is a species that is adapting to the buddleia as a host plant. Hi Naomi, I agree it is curious indeed. I would be interested in getting a positive identification on the cocoon. It is possible it is not a butterfly but if you have some images I can shop them around and see if any of my contacts know what it is. I agree we know so little about the earth’s “big plan.” It is one of the things I love most about nature. It is unpredictable and moves by its own drummer. You were right, the “cocoon” is not a butterfly — turns out to be a mantis egg case. Since finding that one, I have found three others in my garden. Hi Naomi, lucky you! It sounds like you will have your own bad-insect patrol this year. Just make sure if you put out hummingbird feeders, that they have reasonable clearance from your plants and branches. I have seen adult mantis catch the juvenile hummers. Poor hummers! I’ll keep that in mind!